Wikipedia offers the following summary of the Watergate scandal, and it is republished here, in part, for reference. You will find the declassified documents obtained below. The Watergate scandal was a major political scandal that occurred in the United States in the 1970s as a result of the June 17, 1972, break-in at the Democratic National Committee (DNC) headquarters at the Watergate office complex in Washington, D.C., and the Nixon administration’s attempted cover-up of its involvement. When the conspiracy was discovered and investigated by the U.S. Congress, the Nixon administration’s resistance to its probes led to a constitutional crisis. The term Watergate has come to encompass an array of clandestine and often illegal activities undertaken by members of the Nixon administration. Those activities included such “dirty tricks” as bugging the offices of political opponents and people of whom Nixon or his officials were suspicious. Nixon and his close aides ordered harassment of activist groups and political figures, using the Federal Bureau of Investigation (FBI), the Central Intelligence Agency (CIA), and the Internal Revenue Service (IRS). 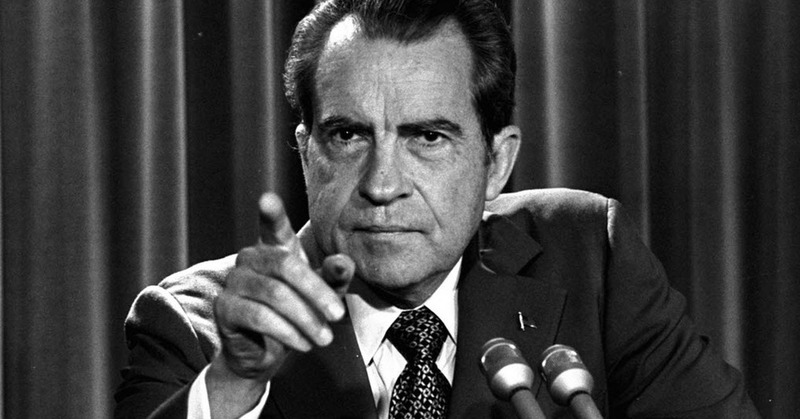 The scandal led to the discovery of multiple abuses of power by the Nixon administration, articles of impeachment, and the resignation of Richard Nixon, the President of the United States. The scandal also resulted in the indictment of 69 people, with trials or pleas resulting in 48 being found guilty and incarcerated, many of whom were Nixon’s top administration officials. 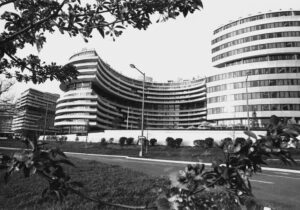 The affair began with the arrest of five men for breaking and entering into the DNC headquarters at the Watergate complex on June 17, 1972. The FBI connected cash found on the burglars to a slush fund used by the Committee for the Re-Election of the President (CRP), the official organization of Nixon’s campaign. In July 1973, as evidence mounted against the President’s staff, including testimony provided by former staff members in an investigation conducted by the Senate Watergate Committee, it was revealed that President Nixon had a tape-recording system in his offices and that he had recorded many conversations. After a protracted series of bitter court battles, the U.S. Supreme Court unanimously ruled that the president had to hand over the tapes to government investigators; he eventually complied. Recordings from these tapes implicated the president, revealing he had attempted to cover up the questionable goings-on that had taken place after the break-in. Facing near-certain impeachment in the House of Representatives and equally certain conviction by the Senate, Nixon resigned the presidency on August 9, 1974. On September 8, 1974, his successor, Gerald Ford, pardoned him. Hunt, E Howard – [ 169 Pages, 9.3MB ] – Everette Howard Hunt, Jr. (October 9, 1918 – January 23, 2007) was an American intelligence officer and writer. From 1949 to 1970, Hunt served as a CIA officer. Along with G. Gordon Liddy and others, Hunt was one of the Nixon White House “plumbers” — a secret team of operatives charged with fixing “leaks” (real or perceived causes of confidential Administration information being leaked to outside parties). Hunt and Liddy engineered the Watergate burglaries and other undercover operations for the Nixon Administration. In the ensuing Watergate scandal, Hunt was convicted of burglary, conspiracy, and wiretapping, eventually serving 33 months in prison. Mitchell, John – [ 2,729 Pages, 157MB ] – John Newton Mitchell (September 15, 1913 – November 9, 1988) was the Attorney General of the United States from 1969 to 1972 under President Richard Nixon. Prior to that, he was a noted New York municipal bond lawyer, director of Nixon’s 1968 presidential campaign, and one of Nixon’s closest personal friends; after his tenure as Attorney General, he served as director of Nixon’s 1972 presidential campaign. Due to his involvement in the Watergate affair, he was sentenced to prison in 1977, serving 19 months. As Attorney General, Mitchell was noted for personifying the “law-and-order” positions of the Nixon administration, amid several high-profile anti-war demonstrations. CIA Inspector General Report on Watergate, Denial Letter [2 Pages, 0.5MB] – For whatever reason, after all these years, the CIA is still withholding, in it’s entirety, the CIA’s Office of the Inspector General’s Report on Watergate. Here is their official denies letter sent to me on 7 April 2015.